COLLIDESCOPE was our response to the open call was for a temporary pavilion to activate the urban beach in Toronto during the cold months. The theme for 2017 was: RIOT. To Riot, in its more creative and collaborative sense, is the act of seeing oneself, others, and the world from a new and radical perspective. Collidescope offers the viewers an infinite and distorted glimpse of themselves, their counterparts and the world around them. This abstraction allows one the space and distance to properly see and re-interpret their surroundings in a new and radical way. COLLIDESCOPE is a viewing instrument using the kaleidoscope effect created by placing mirrors at acute angles to each other, to create infinite and distorted patterns. We have created a double ended version where viewers are able to look from the ground up towards the lake and sky, and from on top of the lifeguard station towards the beach. Both offer the viewer a glimpse of the larger shifting context, the other viewer and themselves. 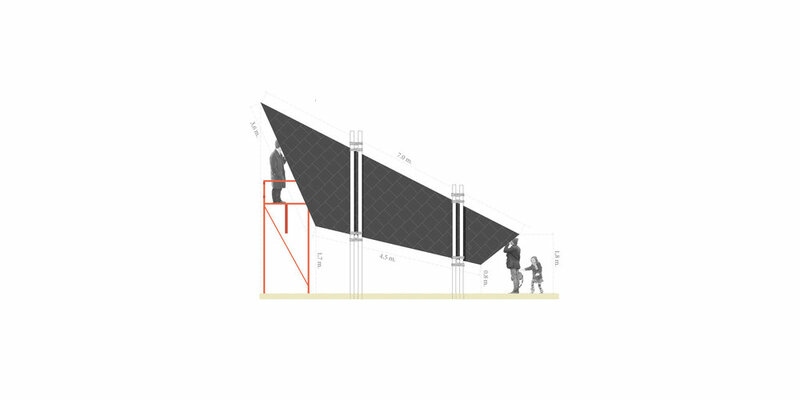 COLLIDESCOPE is made of plywood sheets, coated with a reflective film, clad externally with recycled asphalt roof tiles, and supported by a simple timber structure anchored in the sand. All joints are reinforced with rope and all materials apart from the reflective film are fully recyclable. However, our hope is that COLLIDESCOPE becomes a traveling installations around Toronto offering its inhabitants a chance to see their city and themselves in a new way!